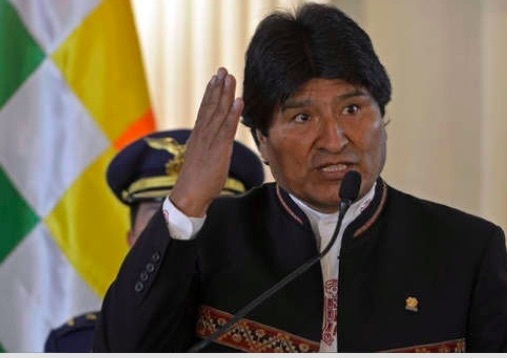 The president of Bolivia and friend of his Venezuelan counterpart, Nicolás Maduro, Evo Morales, said Wednesday that the United States wants Venezuela to be “devastated and impoverished” like Iraq and Libya, by provoking violence through its threats to coexistence in Latin America. . He also accused the US government of seeking that Venezuela “be devastated and impoverished as Iraq and Libya”, referring to interventions in which the United States participated in those countries. Morales said in another message on the well-known social network that “by failing at the UN to justify a military intervention that allows it to take over Venezuela’s oil, the United States arbitrarily confiscates the money of the Venezuelan people to finance the coup [… ] The United States undermines peace and the right of peoples to dispose of their natural resources, “he added. Latin America, has it taken the lead in the struggle for a culture of peace? The economic sanctions of #EEUU against the brother country of #Venezuela, when trying to confiscate the assets of @PDVSA, violate the Charter of the United Nations that recognizes the equality and sovereignty of the States, as well as the self-determination of the peoples. The threats of #EEUU against #Venezuela are threats to peaceful coexistence in # AméricaLatina. They want to provoke confrontation between brothers with war and violence. The empire wants Venezuela to be devastated and impoverished as were Iraq and Libya. # AméricaLatina is a region of peace, we are once again planning to build a South American identity in terms of defense and reject any attempt at intervention. We must promote the peaceful resolution of conflicts and a culture of peace on the continent and the world.